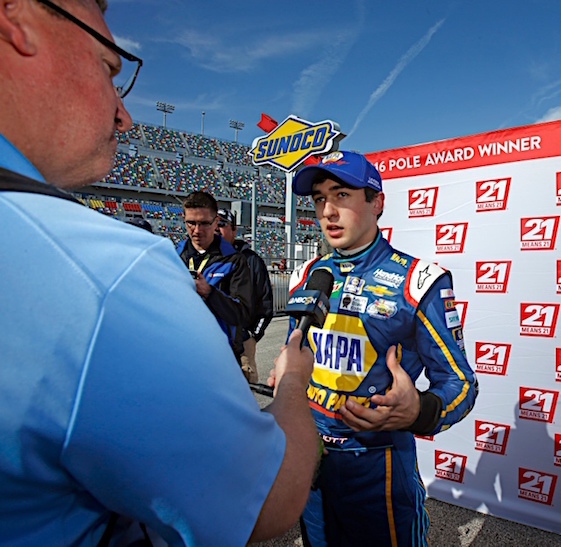 Chase Elliott continued his Speedweeks’ run for glory Saturday by winning the Powershares QQQ 300 NASCAR XFINITY Series race at Daytona International Speedway. Elliott, who won the pole for Sunday’s Daytona 500 last Sunday, held off Joey Logano to get the victory on Saturday. Elliott, the 20-year-old son of NASCAR Hall of Famer Bill Elliott, led much of the final stages of the race. He led the final 13 laps after the last restart of the race. Driving the No. 88 Chevrolet of JR Motorsports, Elliott put blocks on Logano over the final lap and the two contacted each other’s bumpers but Elliott went on to win by .0043 seconds. Logano was runner-up for the third time during Speedweeks, having run second to Denny Hamlin in last Saturday’s Sprint Unlimited and second to JR Motorsports co-owner Dale Earnhardt Jr. in Thursday’s first Can-Am Duel. Kasey Kahne finished third and XFINITY regular Elliott Sadler fourth in the season opener, as JR Motorsports grabbed three of the top four positions. Austin Dillon ran fifth, followed by Darrell Wallace Jr. and rookie Brandon Jones. “That was a heck of a battle, man,” said Elliott, who survived early contact during a six-car incident on Lap 13 and rallied to win his first XFINITY race at Daytona and the fifth of his career. “I had such a great car, and we just found ourselves in the right place at the right time. Elliott’s drive left his team owner, Dale Earnhardt Jr., impressed. “Chase obviously did what he had to do there at the end of the race,” Earnhardt said. “I thought that was very gutsy to be able to really put such an aggressive block on the 22… He did what he had to do to keep the guy behind him, and it won him the race. Top 10 in Points: E. Sadler – 38; D. Wallace Jr – 35; B. Jones # – 34; D. Suarez – 33; B. Koch – 32; B. Gaughan – 32; J. Allgaier – 29; T. Dillon – 29; D. Armstrong – 27; J. Clements – 26.